In a letter to EU Foreign Policy Chief Federica Mogherini and Member State foreign ministers, Saharawi civil society groups called on the EU to respect a 2016 European Court of Justice ruling that no trade deal with Morocco could apply to the “separate and distinct” territory of Western Sahara. Representatives of nearly 30 groups from the refugee camps and occupied Territory of Western Sahara urged the EU to cease all talks with occupying power, Morocco, regarding resources and trade in Western Sahara. 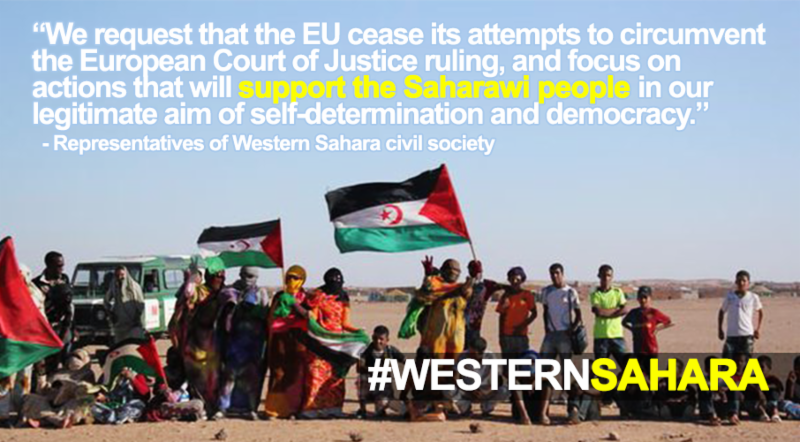 They pointed out the hypocrisy of the EU’s attempts to circumvent its own court decision, and emphasized that such actions undermine the UN political process on Western Sahara – a process that most European states actively support.